Cohort Australia Pty Ltd (Cohort Digital) ABN 54 600 161 386 collects and handles your information under the Privacy Act 1988 rules. When you register your details, enter a competition or submit a questionnaire including your preferences (Your Details) you agree to Cohort Digital and its agents or affiliates, including Brands of Choice and Equifax using Your Details and supplying them to other organisations (who may be located overseas in a wide range of countries including NZ, US, EU and Philippines), for purposes of: sending you information, offers and promotions about products and services based on your preferences and any prize notification (Offers) by mail, phone/SMS/MMS or email; incorporating Your Details in any information products and information management services to provide to Cohort Digital clients; and administering Your Details including improving and personalising Offers, verifying and assessing your identity, maintaining and updating records. Cohort Digital ABN 13 562 062 502 is an Australian company aiming to bring you some of the best offers, discounts and competitions on the Internet. All of the offers have been chosen specifically to benefit you by giving you something fun, useful, entertaining or just downright cheaper than usual! All we ask is that you complete a sign-up survey so that we can bring you further offers, either by email, mail or phone, which match your lifestyle. The information you give us in the survey will help us to choose the offers and competitions which most closely match your interests, so the more you can tell us, the more relevant your offers will be. Entry is open to residents of Australia, New Zealand, the United Kingdom, the European Union, United States of America, Canada and South Africa who are aged 18 years and over, void elsewhere and/or where prohibited by law. Employees of the Promoter, the Promoter's associated companies, the Promoter's agencies associated with this promotion and their immediate families are ineligible to enter. The promotion commences at 12:01am (AEDT) on 2 October 2018 and closes at 11:59pm (AEST) on 24 September 2019 ("Promotional Period"). There will be two draws. The draws will take place at 2.00pm AEDT/AEST at MDSA Level 2, 40 Yeo Street, Neutral Bay NSW 2089. All entries received from 2 October 2018 to 15 March 2019 will be entered in Draw 1 on 19 March 2019; all entries received from 16 March 2019 to 24 September 2019 will be entered in Draw 2 on 26 September 2019. The winners will be notified in writing (email) within 2 working days of the applicable draw date and their name and locality will be published on www.brandleadersgiveaway.com/competitions/winners for Draw 1 on 21 March 2019, and Draw 2 on 30 September 2019 for a minimum of 28 days. 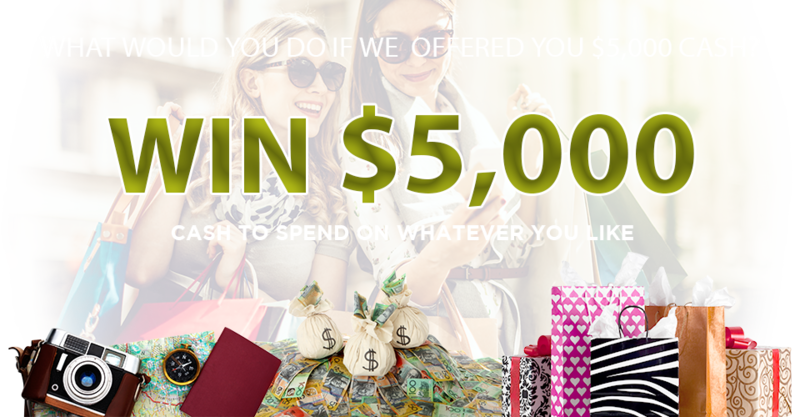 Maximum retail value of each Prize is AU$5,000 including GST. Total maximum prizepool value is AU$10,000 including GST (or local currency equivalent). Travel and accommodation are subject to availability at time of booking for airfares and hotel. The winner and their chosen guest/s MUST travel together and share the same itinerary. Luggage check-in and extra options (e.g. speedy boarding, seat and/or meal selection, upgrades, etc) will be the cost and responsibility of the winner. All other expenses including but not limited to ground transportation to and from the departing and arrivals airport, additional ground transport, all other transfers, meals and beverages, gratuities, applicable taxes, hotel service charges, airport taxes, surcharges, travel and medical insurance, additional spending money, personal expenses, souvenirs, upgrades, incidentals and expenses not expressly specified herein are the sole responsibility of the winner and their chosen guest/s. The winner may be required to present their credit card at time of accommodation check in. The winner must inform the Promoter at least thirty (30) days (prior to their preferred departure date to arrange airfares. Normal terms and conditions of carriage apply, no stop-over is permitted and there is a maximum stay of 3 months, subject to visa restrictions. Airfare tickets are also not applicable on code share services with other operators and the winner is subject to further charges should this not be adhered too. It is the responsibility of the winner to provide correct names of all persons travelling for the booking arrangements, as the Promoter reserves the right to charge the winner AUD100 (or equivalent value) per guests per change in addition to any airfare tax or surcharges that may increase related at the time of booking for any corrections that are required to any of the traveling documents due to misinformation provided by the winner or any change in itinerary made by the winner and/or their guests. Travel documentation in the form of Gift Certificates, Vouchers & Air tickets provided to the winner and their chosen guest/s is to be presented to reservationists for redemption. Failure to present the correct documentation by the winner and/or their chosen guest/s means that redemption will be at the discretion of the provider and the winner and/or their chosen guest/s may forfeit or be charged extra costs for their prize. If the winner fails to notify the Promoter or Prize Partner of a change at least 48 hours prior to departure or they are a no-show they will forfeit their prize. The Promoter and the associated agencies, make no representation as to the safety, conditions or other issues that may exist at any destination. It is the sole responsibility of the winner (and their guest/s) to first check with all government travel advisory information regarding the safety and situation of the destination of their chosen destination/event. The winner (and their guest/s) are advised to consult their healthcare professional regarding recommended immunisations and/or health checks prior to travelling and to check for travel warnings and any perceived hazards with appropriate authorities, including www.dfat.gov.au for Australians. Prize winner (in the case of a minor, the parent/legal guardian (if any) will be confirmed via email and/or phone, and will be required to sign and return, within seven (7) days of notification, an Affidavit of Eligibility, a Liability Waiver, a W-9 Form if required and where allowable, a Publicity Release (collectively, "the Releases"). The Releases will require the winner to furnish his/her Social Security Number for the sole purpose of tax reporting, as required by law. Noncompliance will result in disqualification and an alternate winner may be selected. If a winner is otherwise eligible under these Official Rules, but is nevertheless deemed a minor in his or her state of primary residence, the prize will be awarded in the name of winner's parent or legal guardian who will be required to execute, sign, and return the Releases on minor's behalf. The prize will be awarded within approximately 45 days after the winner is verified. The Promoter reserves the right to redraw in the event of an entrant being unable to satisfy these competition conditions, forfeiting or not claiming a prize. If a prize remains unclaimed or forfeited through ineligibility or otherwise, the Promoter will conduct a further draw(s) at the same time and place as the original draw on 26 June 2019 for Draw 1 and 6 January 2020 for Draw 2 subject to state regulations and the winners, if any, will be notified in writing (email) within 2 working day of the draw/s and their name and locality will be published on www.brandleadersgiveaway.com/competitions/winners from 28 June 2019 for Draw 1 and 8 January 2020 for Draw 2 for a minimum of 28 days. The winners are advised that Tax implications may arise from their prize winning and they should seek independent financial advice prior to the acceptance of the prize. Authorised under NSW Permit No. LTPS/18/27855, ACT Permit No. TP18/01743 and SA Licence No. T18/1599.